Why does a laptop freeze with bad RAM? If you have read our Computer Fundamentals section you will know that the purpose of the RAM is to act as a temporary location for the CPU to pass it’s information whilst it carries out it’s mathematical calculations. RAM chips are subject to environmental damage and sensitive to magnetic fields and this can upset the way in which the RAM is supposed to work. ‘BAD SECTORS’ mean that the CPU can not longer write to the RAM (or Memory). 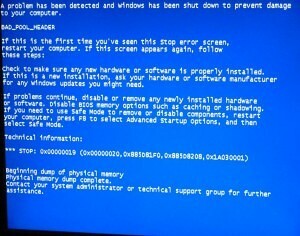 In this instance the computer can restart itself or give you something called a ‘Blue Screen of Death’ (BSOD) in which you will see a message telling you that it is beginning the dump of physical memory. So what can you do about bad RAM? This is a simple answer. You can either test which stick of RAM is bad by removing each stick at a time (ideally replacing each stick with a known good stick of equivalent RAM) and running the laptop to see if the error occurs. You can download Memtest86+ from our downloads section. Use this to create a bootable CD, run the program from the CD and this will tell you if you have a problem. The Memtest86+ website is here if you want to read more about it. If the laptop is also running hot as well as freezing/rebooting then it more likely to be caused by bad air flow through the laptop; this is caused by dust gathering inside the CPU heatsink and blocking vents. The solution is clean it out. To do a professional job on this we recommend you strip the laptop down rather than trying your luck by squirting compressed air into a vent – this doesn’t last long. Use a hoover and a can of compressed air as well as a paint brush to ensure all dust is removed. Go the extra mile by also replacing the thermal paste on the CPU to ensure good heat transfer. This is covered in our laptop disassembly guide. A proper job can take between 1 to 2 hours.